These handsome Ashchurch Grove villas make fabulous family houses with their generous west facing gardens that back onto Ashchurch Park Villas. This property has been redecorated throughout and offers a wide and deep conservatory kitchen / dining space opening onto the South-West facing garden. There is a formal double reception room with wood burner and original dividing doors, ceiling plasterwork and window shutters; there is also ample built-in storage. 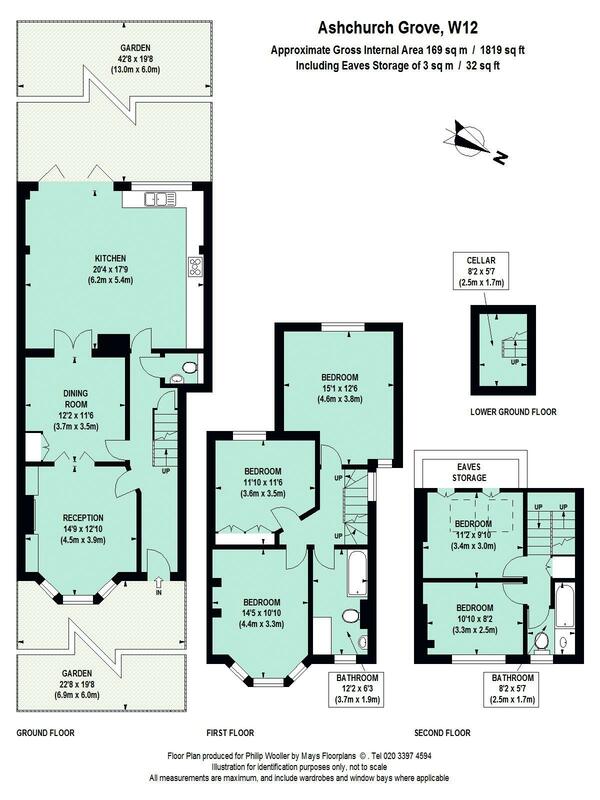 On the first floor there are three double bedrooms and a bathroom; then at the top two further childrens' / guest bedrooms and a further bathroom. Ashchurch Grove is a family orientated cul-de-sac within an area of architectural merit and part of the Ravenscourt and Starch Green Conservation Area. Good local shops on Askew Road and Ravenscourt Park / Stamford Brook tube stations are within a short walk. As are numerous first class state and independent schools and the shopping and transports hubs of Hammersmith and Westfield. 1819 sq ft / 169 sq m approx.